During menopause, you may experience a variety of food cravings that cause you to deviate from an otherwise healthy diet. These cravings and the food you eat are both related to the experience of depression, a common menopausal symptom. Luckily, there are a variety of foods out there that can help clear your mind, uplift your thoughts, and regulate your hormones. Read on to learn more about the health benefits of these foods and their ability to help you fight menopausal depression. Soy is a great food to eat during menopause for a number of reasons. First of all, it is full of phytoestrogens. In menopausal years, estrogen levels decrease, a prime reason for many unpleasant symptoms you may experience. When you consume phytoestrogenic soy, it helps to replace lost estrogen. This, in turn, increases serotonin levels in the brain, helping to fight off depression. Soy products are also low in fat and high in protein. Research has found that people with high levels of beta carotene - a precursor to vitamin A - have better mood regulation than those with deficiencies. Sweet potato contains the highest levels of beta carotene among everyday foods, making it especially valuable for emotional stability. Beta carotene is also an antioxidant that can reduce free radicals in the body, and it is essential in maintaining eyesight. Dark leafy greens contain tons of vitamins and minerals, so they are an efficient food choice. Daily intake of spinach and kale can improve overall cognition and encourage emotional stability. Vitamin C, vitamin A (beta carotene), vitamin B9 (folate), vitamin E, and vitamin K are important for happiness, and dark leafy vegetables contain high levels of all of them. Incorporating dark leafy greens into your diet is an easy way to help with depression. Carbohydrates are essential for a balanced mood, but not all carbs are created equal. Instead of cakes, cookies, biscuits, and white bread, opt for brown rice and other whole grains. These complex carbohydrates are satisfying, versatile, and complementary to other foods listed above. They are digested at a steady rate, helping to prevent mood swings. They can also boost serotonin levels, having a comforting effect on your state of mind. You might not imagine that a handful of nuts could help improve your mood, but these nuts can actually influence brain function. Walnuts are considered “brain food" because of their extremely high omega-3 content. These fatty acids are important for cognitive function and can help clear the mind while making way for mood-lifting neurotransmitters. 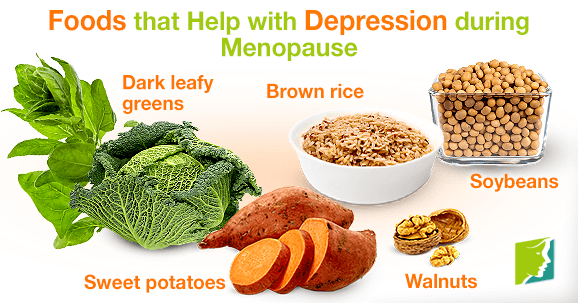 Depression is very common during menopause, but you can beat it with healthy choices and the right foods. Food is not only for your body; it is equally important for your mind. Steer clear of foods you know to be unhealthy and replace them with these mood-boosting options that are easy to prepare, readily available, and delicious. Adding these foods to your diet is an effective tool in treating depression.